stretch ceiling that made from PVC is a great alternative for gypsum and POP ceiling, it enables you to make more decorations and flexible shapes and curves . 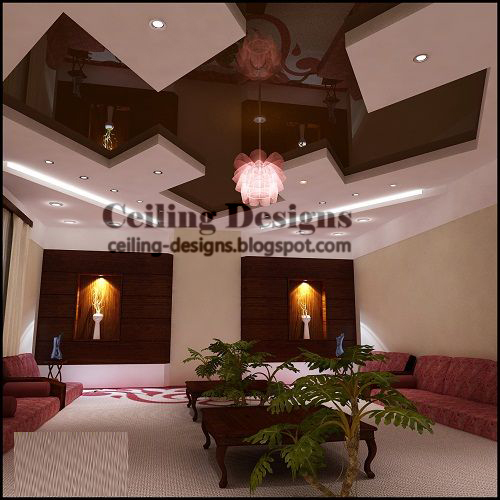 ceiling designs blog is going to present a serious of stretch ceiling ideas for design , decorations and lighting. amazing PVC ceiling , it's also called PVC ceiling, PVC is the material that used in this ceiling , that stretch ceiling has 2 materials, solid PVC that used to make the white frame that install the lighting spots and the other stretch ceiling parts, but the brown part is made from flexible PVC, in the center of the stretch ceiling there is a small fall ceiling accessory made from glass, the stretch ceiling is a false ceiling that is installed under the main ceiling, it makes the process of ceiling repairing more easier .